A healthy Andre Roberson could give Oklahoma City's defense a big boost this season. NBA.com's John Schuhmann gets you ready for the 2018-19 season with a key stat for each team in the league and shows you why it matters. Today, we look at the Oklahoma City Thunder, who lost a critical piece to their defense in late January. The Thunder were 11.2 points per 100 possessions better defensively with Andre Roberson on the floor (allowing 96.4) than they were with him off the floor (107.6). That was the biggest on-off DefRtg differential among 266 players who played at least 1,000 minutes for a single team last season. On-off differential requires context. It's about a player's ability, but also about who he's on the floor with, both his teammates and the opponents, and who's out of the game when he's in. 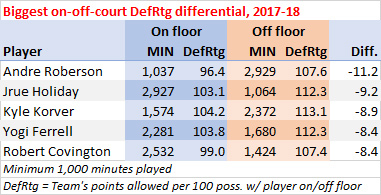 Three of the guys in the top five of on-off DefRtg differential - Roberson, Jrue Holiday and Robert Covington - are clearly impact defenders. The other two - Kyle Korver and Yogi Ferrell - probably benefit some from being reserves and playing against opposing second units that aren't as strong offensively as starting groups. Though Roberson was a starter, he had the benefit of playing 92 percent of his minutes with Russell Westbrook, 75 percent of his minutes with Steven Adams, and 74 percent of his minutes with Paul George. But the Thunder starting lineup with Roberson in it was much better defensively than the other four guys playing alongside somebody else. But the Thunder were only slightly better when the other four starters shared the floor with somebody else than they were when Roberson was the fifth guy on the floor, in part because they didn't depend on half-court offense as much as most teams did, with Roberson finding ways to contribute. Is Oklahoma City the third-best team in the West? Oklahoma City led the league on both points off turnovers (18.7 per game) and second chance points (14.9 per game). That accounted for 31 percent, the league's highest rate, of their scoring. Both George (2.0, 3.9) and Westbrook (1.8, 3.3) ranked in the top five in steals per game and in the top seven in deflections per game. But OKC's opponent turnover rate was highest (18.9 per 100 possessions) with Roberson on the floor. Adams ranked third in offensive rebounding percentage, grabbing 16 percent of available offensive boards while he was on the floor. But Roberson's offensive rebounding percentage of 7.8 percent ranked fourth among 175 players 6-8 or shorter who played at least 1,000 minutes last season. And like their opponents' turnover rate, the Thunder's offensive rebounding percentage was highest with Roberson on the floor. Among 48 lineups that played at least 200 minutes together, the Thunder's starting lineup - Westbrook, Roberson, George, Carmelo Anthony and Adams - ranked first in opponent turnover rate (19.2 per 100 possessions) and second in offensive rebounding percentage (grabbing 33 percent of available offensive boards). Paul George opted to re-sign with the Thunder in the offseason. So, while only one of the five guys (George) had an effective field goal percentage on shots from outside the paint that was above the league average, the lineup was solid offensively. And with an elite defense, it outscored its opponents by 14.1 points per 100 possessions, the eighth best mark among 48 lineups that played at least 200 minutes together. When Roberson was lost for the season (on Jan. 27) to a knee injury, the Thunder ranked fifth defensively, having allowed 103.1 points allowed per 100 possessions. They ranked 15th defensively from that point on, allowing 107.0. If he's healthy this season, the Thunder defense should be back in the top 10 ... and the offense won't suffer as much as you might think. Outscored their opponents by 2.9 points per 100 possessions after getting outscored by 0.2 in 2016-17. That (3.1 points per 100 possessions) was the league's fifth best improvement. Last season was the first time since the 2004-05 season that they played at a pace slower than the league average. Have ranked in the top five in rebounding percentage in each of the last seven seasons. Were outscored by 4.5 points per 100 possessions in the third quarter (ranking 24th) and were a plus-5.4 per 100 possessions (fourth) otherwise. Have been a better-than-average offensive team in eight of the last nine and in 28 of the last 32 seasons. Ranked 28th in ball movement (301 passes per 24 minutes of possession), 28th in player movement (10.2 miles traveled per 24 minutes of possession), and 29th in assist percentage (assisting on 54 percent of their field goals) in the regular season. Assisted on a postseason low 44 percent of their field goals in their first round series loss to Utah. Led the league in offensive rebounding percentage for the third straight season. Saw the league's biggest drop in offensive efficiency from the regular season (107.6 points scored per 100 possessions - 10th in the league) to the playoffs (100.7 - 15th in the first round). 69 percent of their opponents' shots, the second highest rate in the league, came from the restricted area (33 percent - seventh highest rate) or 3-point range (36 percent - third highest rate). 25 percent of their opponents' 3-point attempts, the third highest rate in the league, came from the corners. Only the Knicks (258) and Cavs (257) allowed more corner threes than the Thunder (252). 13.6 percent of opponent possessions, the third lowest rate in the league, were in transition. Forced their opponents to take 19 percent of their shots, the second highest rate, in the last six seconds of the shot clock. Allowed 118 fewer points than any other team from opposing pick-and-roll ball-handlers, with the league's lowest rates in both the percentage of opponent possessions that were pick-and-roll ball-handler possessions (12.4 percent) and how efficiently their opponents scored on those possessions (0.77 points per possession). Got only 24 percent of their total scoring, the second lowest rate in the league, from off the bench. Lineup of Westbrook, Roberson, George, Anthony and Adams grabbed 57.4 percent of available rebounds, the best mark among 48 lineups that played at least 200 minutes together. Lineup of Westbrook, Ferguson, George, Anthony and Adams averaged 23.0 second chance points per 48 minutes, the highest mark (by a wide margin) among those same 48 lineups. The Thunder had three of the four lineups that played at least 200 minutes and averaged 17.0 or more second chance points per 48. Lineup of Westbrook, Huestis, George, Anthony and Adams allowed opponents to shoot 46.5 percent from 3-point range, the highest mark for 62 lineups against which opponents attempted at least 100 3-pointers. Outscored their opponents by 4.9 points per 100 possessions in 1,976 minutes with Westbrook, George and Anthony on the floor together. Outscored their opponents by 14.6 points per 100 possessions in 352 minutes with Westbrook and George on the floor without Anthony. Were 9.6 points per 100 possessions better offensively with Westbrook on the floor (scoring 110.0) than they were with him off the floor (100.4). That was the third biggest on-off OffRtg differential among 266 players who played at least 1,000 minutes for a single team last season. Alex Abrines shot 44 percent from 3-point range at home and just 33 percent on the road. That was the second biggest home-road differential among 139 players with at least 100 3-point attempts both at home and on the road. Abrines' ratio of 3-point attempts to mid-range attempts was 15/1, the fifth highest ratio among 207 players who attempted at least 200 shots from outside the paint. Steven Adams took 98 percent of his shots in the paint. That was the second highest rate among 180 players who attempted at least 500 shots. Adams was the first player in the last 20 years to average at least 7.5 rebounds per game, with more offensive rebounds (384) than defensive rebounds (301). Adams ranked second with 4.9 screen assists per game. Terrance Ferguson committed turnovers on just 5.4 percent of his possessions, the lowest rate among rookies who averaged at least 10 minutes per game in 40 games or more. Paul George tied for third in the league with 177 catch-and-shoot 3-pointers. He shot 33.2 percent from mid-range, the fourth worst mark among 57 players who attempted at least 200 mid-range shots. George's 41.9 minutes per game in the playoffs ranked second behind LeBron James (also 41.9). Jerami Grant had an effective field goal percentage of 64 percent after the All-Star break, up from 54 percent before the break. That was the second biggest jump among 203 players who attempted at least 250 pre-break shots and 100 post-break shots. Grant shot 26 percent on corner 3-pointers, the third worst mark among 125 players who attempted at least 50. Dennis Schroder ranked third with 16.4 drives per game and second with 9.4 points per game scored on drives. He scored 1.09 points per possession on isolations, the third best mark among 30 players who averaged at least two isolation possessions per game. Schroder shot 29.0 percent from 3-point range, the worst mark among 116 players who attempted at least 250 threes last season. Schroder was one of three players with no turnovers and at least 15 assists in a game last season. Russell Westbrook led the league in time of possession (9.2 minutes per game), though he saw the second biggest drop in usage rate (from a record 41 percent to 33 percent) among players who played at least 1,000 minutes each of the last two seasons. He also led the league in assists (10.3 per game) and assist percentage, assisting on 46 percent of his teammates' field goals while he was on the floor. He also led the league in drives (19.2 per game), and fast break points (5.5 per game). Westbrook also led the league with 10 buckets (on 27 attempts) to tie or take the lead in the final minute of the fourth quarter or overtime. Westbrook made 1.2 3-pointers per game, down from 2.5 in 2016-17. That was the second biggest drop (behind that of Nick Young) among 260 players who played at least 40 games in each season. Westbrook had 229 assists to Adams. That was the most assists from one teammate to another last season. NBA TV's Thunder preview premieres at 6:30 p.m. ET on Friday, Sept. 28.